Hello Everybody! It has been a while since I have blogged and I am quite sure those whom I blogged for have noticed. I completely apologize for my disappearance but I am dealing with an illness that does limit my time in second life. Anywhooo lets talk about the awesomeness that I am blogging. When I logged in this past weekend I was happy to see this blogger pack from :::insanya::: since I always adore the items that she creates. I put on the corset and gacha items (bracelet & collar) and then stood there for a while trying to figure out what I had in my inventory that I have not worn yet. I tend to purchase items and never wear them but I am going to change that habit this year. I paired the corset with a skirt by =Kio= which was available at the Creepy Kawaii Fair. I loved how it worked so well with my new Maitreya body. The corset is fitted to work with the Maitreya and SLINK mesh bodies and it comes with a hud so that you can texture change it to any color your desire. Like many of the other bloggers I had the opportunity to get a sneak peek at Skin Fair this year and it was beautiful. There were a ton of designers that were new to me and some old time favorites like recently rebranded Paper Rabbit, previously known as Ploom Skins. You have so many options when it comes to this skin. I love the freckles option and there are 3 skins available in multiple skin tones. I chose the powder skin tone since I prefer pale skins. There are also 3 options of makeup as you can see below. As summer comes to an end, we are all starting to feel some changes in the climate. Some of us not so much. But before we know it, Fall will be here and it will be time to bring out the sweaters and hot cocoa. I am showcasing a few items from the following stores: [bubble], :::insanya:::, and Koy. In the picture above I am wearing frayed shorts by [bubble] that were available at the Thrift Shop. I am also wearing a new tattoo by :::insanya::: called “Strong Spirit” in the fresh ink option so that you can get a great view of the beautiful artwork. The mini-top that I am wearing is also by :::insanya::: and my hair is called “Goodbye Summer” and it is by Koy. I chose to wear the pink color from the Unnatural’s Pack because I wanted to try to be a little different than usual. I love the bangs on this hairstyle. I love how they come together in the front but don’t cover your eyes. The rest of the hair is kind of swept back loosely on your back. 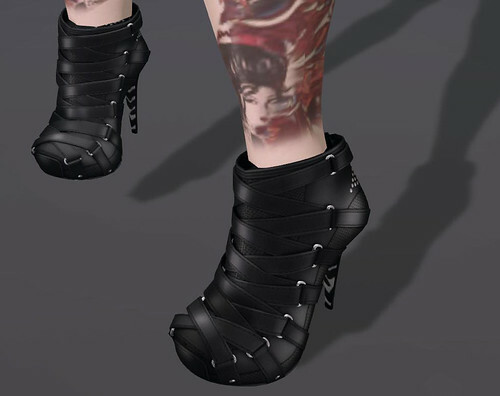 Now I can’t end this post without showing you my amazing shoes by :::insanya::: they come with a texture changing hud that allows you to customize them to a variety of colors. I opted to keep mine black. I just loved the unique look of the shoes and to me they uttered sexiness. poses: .ploom. Poses – P.Y.T.